Recommendations: 1 softgel daily, may increase as desired. Using patented technology, this proprietary complex provides enhanced absorption and sustained retention time at meaningful levels in the body. 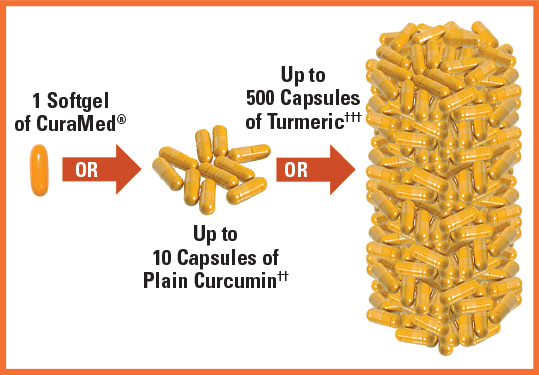 When compared gram per gram, BCM-95® Curcumin delivers up to 10 times more curcumin to the bloodstream than plain curcumin. This is the first award for CuraMed! Curcumin (Curcuma longa) Rhizome Extract (BCM-95®), phospholipids, turmeric essential oil, supplying 500 mg of pure curcuminoids. Other Ingredients: medium chain triglycerides, gelatin, glycerin, sunflower lecithin, yellow beeswax, purified water, and turmeric in sunflower oil (softgel color). BCM-95® is a registered trademark of Dolcas-Biotech, LLC. 2015 Vity Award - Best Antioxidant in the Vitamin & Mineral Category. Curcumin (Curcuma longa) Rhizome Extract (BCM-95®), phospholipids, turmeric essential oil, supplying 250 mg of pure curcuminoids.